The Ad Council and AARP are asking all of us to support and to help raise awareness of the Caregiver Assistance campaign. 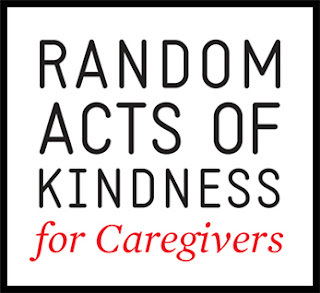 November is National Family Caregivers month, and the Random Acts of Kindness initiative aims to recognize and support the 40 million unpaid caregivers in the U.S. Many caregivers are boomer women, often sandwiched between the needs of their parents and their own kids. Or like me are single individuals, and an only child attempting as best we can to help care for our elderly parents. A popular misconception is that caregivers are paid medical professionals, providing full-time care to someone in need of daily help, when in reality, most caregivers are family members or friends who are also working and managing their own families at the same time. For many, the care giving role starts with simple things like scheduling a doctor’s visit or helping with daily errands, but gradually expands over time, until it becomes a major commitment in their lives. Almost three in ten people who are caring for someone say their life has changed with care giving, oftentimes for the negative. More than one in five say their weight, their exercise, or their social life has/have suffered. Emotionally, one in five say they are generally unhappier and one in three say they feel sad or depressed. That’s why AARP created a community where caregivers can connect with experts and other caregivers and can find information and tools to take even better care of the person who once took care of them. This often happens overnight, like what happened to me. My Mom is a vibrant and active woman who lives in her own apartment and up until the day she tripped over the doorjamb to her kitchen and fractured her shoulder was really in great shape-physically and mentally. Although before the accident she still drove herself to appointments near to where she lived-I had been driving her if that appointment was any distance. Or if she wanted to go visit relatives or friends. I still work as a free lance bookkeeper and keeping our schedules straight was and is no easy feat. It has been a blessing that I am semi retired. For the first month we had professional caregivers--what a laugh--after 2 days she decided that she only wanted them 8 hours a day and then cut it to 4-then none-Meanwhile I was there almost every day anyway--taking them out food shopping, getting clothes that she could get into and out of by herself in addition to all the doctor appointments. Talk guilt trip--my Mom it turns out is really good at making me feel guilty! I'd say the worst part is --she is suddenly afraid to drive at all--but won't get rid of her car which means I have to use it with her in it at least once every two weeks. I am not complaining-I do what I have to do but I am eternally grateful for her friend who drives her back and forth to the senior center where they play Bridge, Mahjong and (senior) Yoga. And just recently her next door neighbor has been taking her to get a mani/pedi every week or so when she goes herself. I wonder if they realize just what these little random acts of kindness do for me as well as my Mom? I am so glad now that back when I was younger I used to help my elderly neighbors--walk up the street to get medicine in a major snow storm when the pharmacy would not deliver--pick up things at the grocery store--just knock on their doors to make sure they were okay and did not need anything. Believe me when I tell you that even the smallest random act of kindness whether directly for that caregiver or for the person they are caring for makes a world of difference. 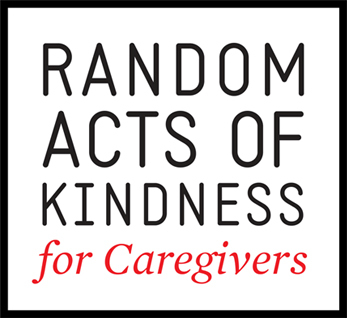 This November The Ad Council and AARP are kicking off a program designed to encourage all Americans to perform an unexpected ‘Random Act of Kindness’ for a caregiver. By starting a nationwide movement, we’ll raise awareness of caregiving and caregivers while at the same time reaching caregivers directly—helping to alleviate some of their daily stresses and reward them for their ongoing support. Identify someone in your life or in your community who is serving as a caregiver and do something nice for them. It doesn’t have to be complicated or expensive, just a small gesture that makes a caregiver’s life a little easier. Tell your readers about this initiative-either share this post or write a blog post of your own. You can also share your story. If you submit a 150 word or less summary of how you made a caregiver feel special and photo, you will be entered to win a cash prize from our $10,000 pot. My mom has been sick for a really long time and my sister, brother, father and I all take turns taking care of her. These are great! My brother needs a caregiver, and I'll definitely send this link to him. Thank you! Caregiving is a tough job. This is a great idea to let them know they are appreciated. I have a friend whose working as a caregiver, she really loves to give a care in nursing home. Giving a care into other people was really a heart warming, I'm so thankful that there are few people who give a care for those need it. What a sweet way to honor them for the service that they provide. I think this is an amazing program to be part of. I was a caregiver for my mom for almost 9 years and it is so stressful! That said, I would do it all over again. I think this is a wonderful idea. Caregivers give so much of themselves to their work. It's great to doing something nice for them. This is a great post, a great way to raise awareness and a great way to recognize those who do what is sometimes a thankless job! Caregivers are often overlooked when someone is terminally ill or sick. The caregivers often give of their entire selves, and are rarely repaid. Great cause. This is a great initiative. Thanks for sharing. Being a caregiver is so consuming. It's important for people to feel supported. What a great idea. I know many people would appreciate this especially my mom who took care of my aunt for many years.